JEDDAH — With the start of Haj just a few days away, officials from numerous ministries and departments, including the Ministry of Health, are making the rounds to ensure that all Haj procedures and facilities designed to facilitate the arrival of about two million pilgrims are in place and ready to welcome Muslims from across the globe. 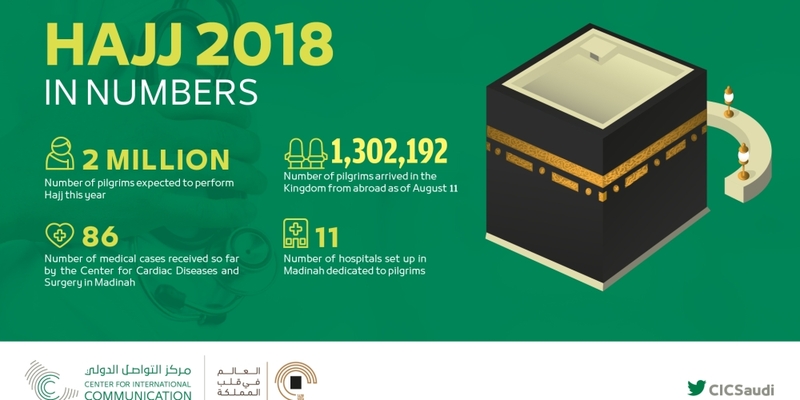 A total of 1,302,192 pilgrims had arrived in the Kingdom from abroad until Saturday, registering a nearly 6% increase compared to the same period last year, according to the Directorate General For Passports. Haj officially starts on Aug. 19. No epidemic or quarantine diseases have been reported so far. However, the Ministry of Health is prepared to meet contingencies. In Madinah, 11 hospitals have been set up in the area to provide services specifically to pilgrims while other hospitals have made preparations for emergency cases. All hospitals are supported by 13 primary seasonal healthcare centers. The Jeddah Health Affairs has assigned 115 doctors, technicians and administrators to work in the Health Control Centre at Jeddah Islamic Port through which many pilgrims will arrive. In addition to verifying health certificates of pilgrims arriving via the port, medicine and required vaccines will also be available. Hamad Al-Dowaila, Vice Minister of Health, recently paid visits to many health facilities in Jeddah and Makkah to check on their readiness to deal with the rush of pilgrims in the coming days. He also paid a visit to King Abdul Aziz Airport’s pilgrim city, where he was briefed on preparations and received a detailed account of the various departments represented and the services they provide. He also toured one of the arrival halls for pilgrims. The newly launched program, the Makkah Route Initiative, is designed to streamline procedures for religious travelers to Saudi Arabia by allowing them to undergo many of their entry procedures while still at their airport of embarkation. Introduced this year in Malaysia and Indonesia because of the large number of pilgrims coming from these two countries, the Makkah Route Initiative allows health records to be viewed electronically before pilgrims arrive in the Kingdom. Pilgrims coming from the two countries can also be fingerprinted and have their passports stamped before departing.